Bananas are a staple fruit in our home because they are so very inexpensive, even the organic bananas are much cheaper per pound than other fruits. And when I can find them marked down because they’re getting brown I buy all I can. We freeze some to use in smoothies and banana bread. 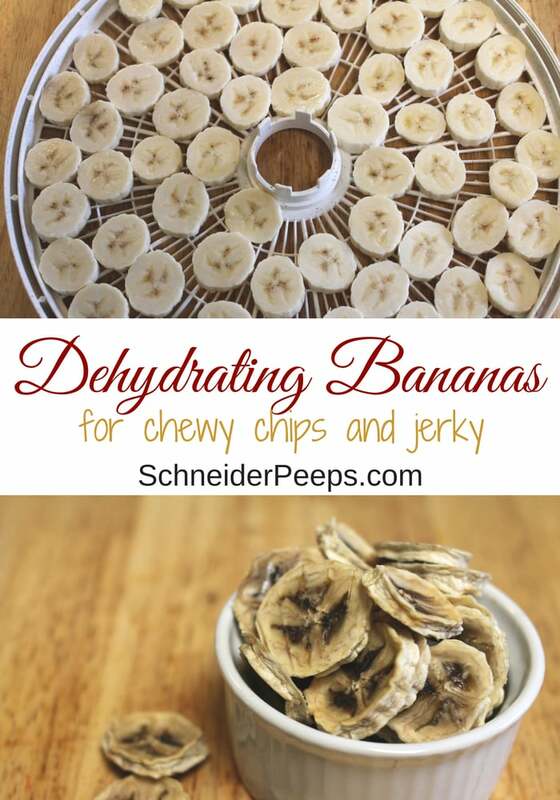 But we also like to dehydrate bananas to make banana chips and banana jerky. I like to use these worksheets to keep track of all the food I preserve and store. You can get them emailed to you by filling out the form below. Banana jerky is just dehydrated banana sticks. Most of my kids prefer banana sticks to banana chips, I think because they’re chewier. I’m not a fan of either, but everyone else in my family (and my kids’ friends) love them. Divide each half into thirds. Bananas naturally have three sections so we just gently push our finger down the center lengthwise and the banana divides. Put them in the dehydrator until dried. 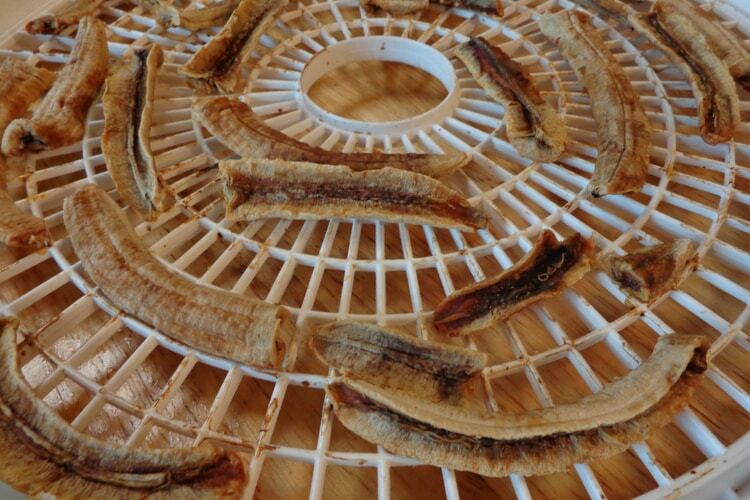 In our dehydrator (at 135°F) it takes about a day to dehydrate bananas. Just check them every so often to get them to the texture you like. We like them when they’re still a bit flexible and not crispy or hard. This the dehydrator I have; it works great, is reasonably priced, and doesn’t take up a lot of storage space. Are you looking to make crispy banana chips at home, you know like the ones you find at the store? Well, it’s probably not going to happen. If you just love the crispiness of store bought banana chips, enjoy them occasionally but don’t expect your home dehydrated banana chips to be crispy. Even though they’re different than store bought I think you’ll enjoy home made banana chips just as much once you accept that they’re different. 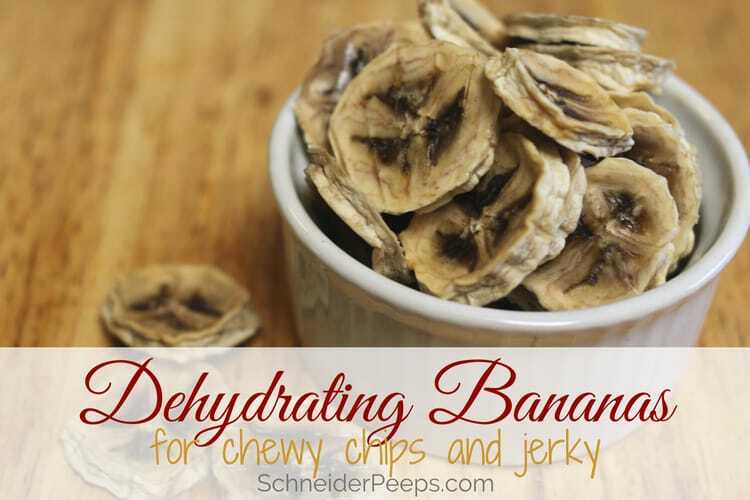 To make dehydrated banana chips, peel the bananas and slice them into 1/4″ slices. Collect the banana peels to compost. Dip banana slices in lemon juice or citric acid and water if you don’t want them to turn brown (we don’t care so I usually skip this step.) You can also use a spray bottle and just spray the slices. Put them in the dehydrator until dried. 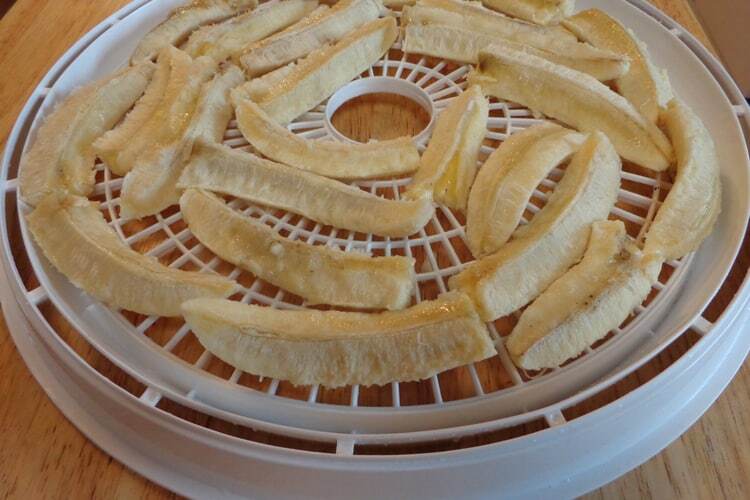 In our dehydrator (at 135°F) it takes about 8 hours to dehydrate bananas chips. Just check them every so often to get them to the texture you like. I store dehydrated bananas in wide mouth quart size mason jars. If they are fully dehydrated they should store well for several month but we’ve never had them last that long. If you want to store them for longer than a few months, I would suggest putting an oxygen absorber in the jar or storing the jar of dehydrated bananas in the freezer. We like to eat dehydrated bananas as a snack but they can be reconstituted and used like fresh bananas – obviously,they won’t be exactly like fresh bananas but they’re pretty close. To reconstitute dehydrated bananas put one part bananas to one part water in a sauce pan and simmer for 5 minutes. If making banana chips, slice bananas in 1/4" slices. If making banana jerky, break the bananas in half then divide each half of banana into thirds. Dip banana slices (or sticks) in lemon juice or citric acid and water if you don't want them to turn brown (we don't care so I usually skip this step.) You can also use a spray bottle of lemon juice and spray them which works great if you're dehydrating a lot of bananas. Put them in the dehydrator until dried. 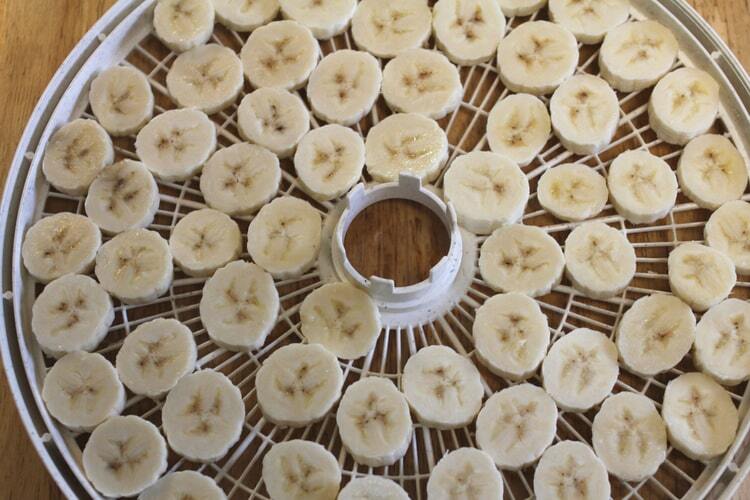 In our dehydrator (at 135°F) it takes 8-12 hours to dehydrate bananas. Just check them every so often to get them to the texture you like. We like them when they're still a bit flexible and not crispy or hard. 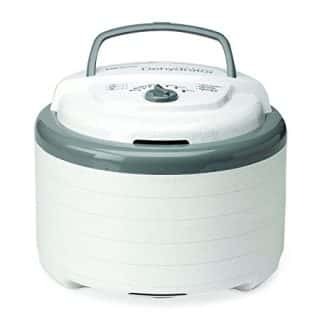 This the dehydrator I have; it works great, is reasonably priced, and doesn't take up a lot of storage space. Store dehydrated bananas in wide mouth quart size mason jars. If they are fully dehydrated they should store well for several months. If you want to store them for longer than a few months, I would suggest putting an oxygen absorber in the jar or storing the jar of dehydrated bananas in the freezer. To reconstitute dehydrated bananas put one part bananas to one part water in a sauce pan and simmer for 5 minutes - obviously,they won't be exactly like fresh bananas but they're pretty close. A few months ago I received a copy of the Prepper’s Dehydrator Handbook by Shelle Wells from the publisher. I’ve known Shelle for several years, she’s the founder of Preparedness Mama and Rockin’W Homestead. She’s also one of the founders of Rootsy along with me and two others). One thing that I know about Shelle is that she is passionate about preparedness, especially food preparedness. One of the things that has always bothered me about the “preparedness” community is the reliance upon commercially dehydrated or freeze dried food. That just doesn’t seem very cost effective or sustainable to me. But knowing how to dehydrate my own food and store it properly is cost effective and sustainable. 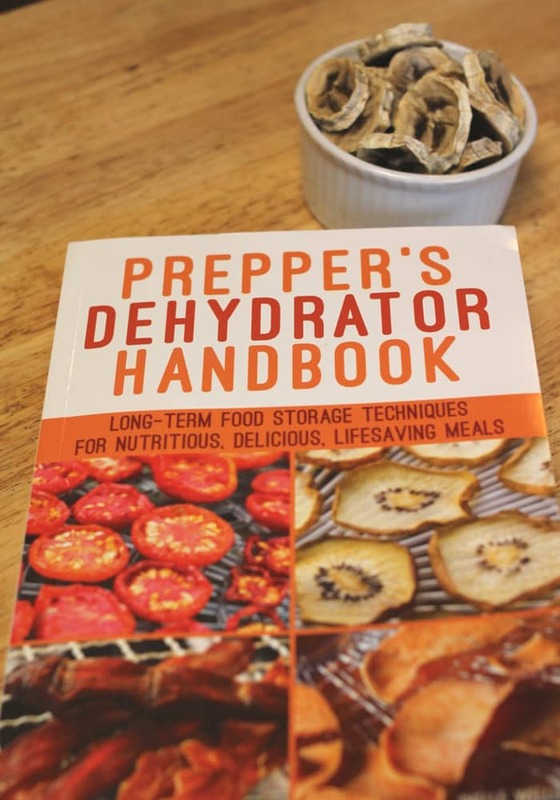 Prepper’s Dehydrator Handbook is FULL of dehydrating information and helpful tips. It covers dehydrating fruits, vegetables, meat, herbs and even soups. I found myself highlighting and making notes in the margins for future reference. The second half of the book is recipes for using the dehydrated foods. It’s important to use the food you store in order to rotate your supply and to get your family used to eating home preserved food before they HAVE to. While I think the book’s content is wonderful, I do wish the publisher would have used a darker print. It’s not so light that it’s hard to read, but it is light and for those of us who struggle with poor eyesight a darker font would be nice. The other thing to be aware of is that there’s no index in the back of the book. However, the Table of Contents is so very detailed that an index really isn’t necessary. I just find myself turning to the back of the book out of habit and being surprised there’s no index. I think the Prepper’s Dehydrator Handbook is a great resource for anyone who is looking to preserve food by dehydrating. I’m glad to have it one kitchen bookshelves. As usual I recommend that you borrow this book from your local library (they can inter-library loan if they don’t carry it) before you purchase it just to make sure it’s something you’ll want to refer to over and over. What fruits do you like to dehydrate? Question. Most recipes state lemon juice however also mention water. Usually there is no amount of each to mix. Why? Hi Linda, that’s a very good question. I don’t normally dip my fruits in lemon juice or lemon juice and water because I don’t really care if they brown. But I know that’s not for everyone…lol. According to the National Center for Home Food Preservation the ratio of lemon juice to water is 1:1. So one cup lemon juice to one cup water. (https://nchfp.uga.edu/how/dry/csu_dry_fruits.pdf) Hope this helps.